This rustic soup is the kind you eat with a loud slurp and a satisfied growl. My friend T. and I had spent the day taking in a double-feature and thanks to a combination of time crunch, lean wallets and exorbitant movie theatre food prices, our stomachs boasted but a winning combination of Sour Patch Kids and Twizzlers. We felt lightheaded and weak. T. suggested we go to his place and make some soup to bring us back to solid ground. One of the things I love about T. is his ability to cook solely through inspiration. No recipe - just asking the food what it wants to be. Genius. This soup wanted to be simple, rustic, and satisfying. To start, T. broke up some pappardelle pasta nests. 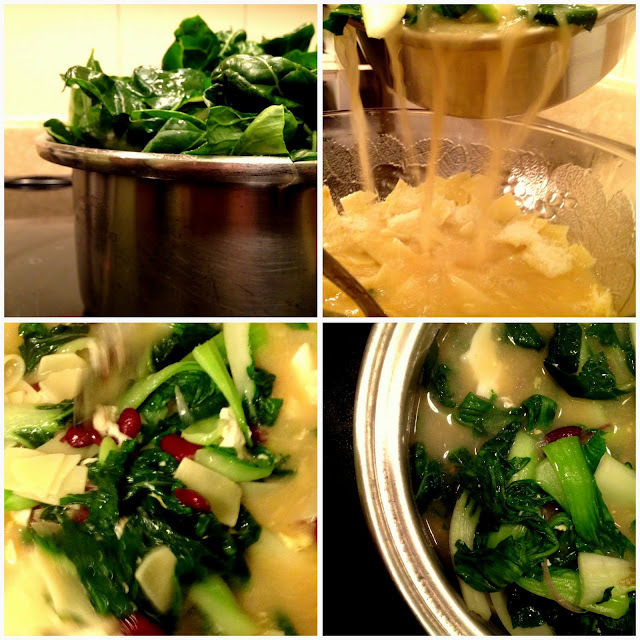 As the pasta boiled to almost-done (it would finish cooking in the soup stock later), lush and leafy greens were washed and red kidney beans were rinsed. I am a believer in the 'you are what you eat' philosophy. On (yes, 'on' - like a drug) empty sugars I am empty and lightheaded. My taste buds like the initial high, but the letdown leaves my stomach lonely and unsatisfied. On greens, beans, and wholesome things I'm keen and alive - there is an inherent grounding quality in hearty vegetables and broth and when eating this soup you feel as though you are wholeheartedly taking life in. An equally important philosophy I've come to appreciate lately is 'you are how you eat' and this involves everything from the approach to selecting ingredients to preparing, cooking, serving and eating them. It is about respecting the essence of what you are cooking with - nothing fancy required. If you cook with love and eat to honour both your body and the food you've made, that love directly enhances the taste of the food and the experience of eating it, not to mention the absorption of its nutrients and energy and ease of digestion. A lot of love went into the making of this soup. For the greens, T. had some beautiful bok choy and leafy swiss chard. I love how the cut-off ends look like flowers. The pasta was then flavoured by the drizzling of hot pepper oil and the liberal grating of Parmesan and Romano cheese. The greens were roughly chopped and a red onion was sliced to add texture and further flavour. The wonderful thing about this soup is it translates itself to suit your pantry. Anything goes. Use a different kind of pasta, swap beans, throw in some spinach or kale. Corn would be tasty. The fun is in the foraging. The greens and beans are added to the hot broth, in which some fresh eggs have been cracked to poach in the liquid. The broth and vegetables are then carefully poured over the noodles and cheese where the heat finishes cooking the noodles, the cheese melts and adds a depth of flavour, and the greens pick up the heat from the pepper oil. This soup tastes fresh and earthy and has various textures - the crunch of the greens, the slippery noodles, the soft eggs and beans. So satisfying. We ate ALL of it. 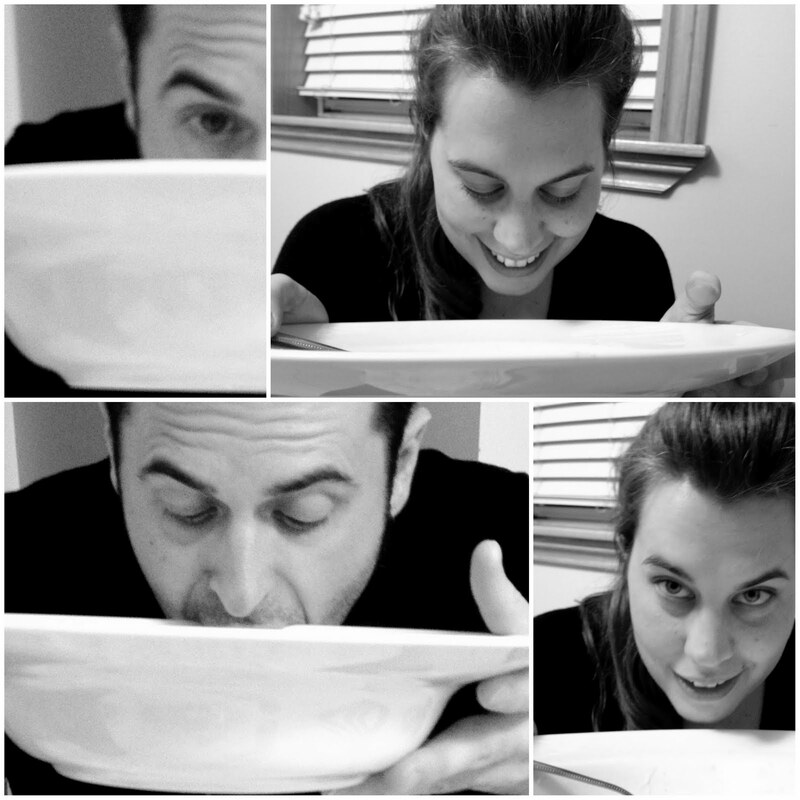 Two huge bowlfuls - it was that good. Now, just so you don't start worrying I'm on a crazy health kick and that I've forgotten my love of butter and baked goods, let me assure you that you have nothing to fear. After thoroughly enjoying this soup that was made with a lot of healthy ingredients and a healthy dose of love, T. and I felt like dessert and were inspired to make 1:30-in-the-Morning French Toast. With lots of butter. Healthy, healthy amounts of butter. Oh, and he didn't have cream, so we went with the pantry-scouring theme of the evening and whisked in some Baileys and cream cheese. Oh, and I mentioned butter, right? And love. Treat your body right by honouring it with healthy foods that ground you and you are more than welcome to indulge sans guilt in heavenly things when the mood strikes. - Found some primo-quality dried pappardelle noodles (extra-wide cousin to fettuccine/tagliatelle) in the pantry; some canned red kidney beans, 2 or 3 organic eggs, and some fresh swiss chard and baby bok choy in the fridge. Along with a little red onion, hot-pepper oil, and grated Parmesan and Romano cheese, and I'm all set. - Immediately put a pot of sea-salt-ed water to boil to cook pasta; crush dried nests of pappardelle in hand (happens to break into appropriately sized pieces); when water comes to a boil cook pasta until just slightly under-cooked. - while that's all cooking trim off bottoms of greens and wash; slice large chard leaves cross-wise into approx 1.5" ribbons; slice baby bok choy leaves vertically down the center of stems. - when eggs are done (you can roughly quarter them while in the pot), turn off heat, throw all greens into pot and gently toss/stir into broth until just nicely wilted (by the heat of the broth and other ingredients) and still vibrant green. 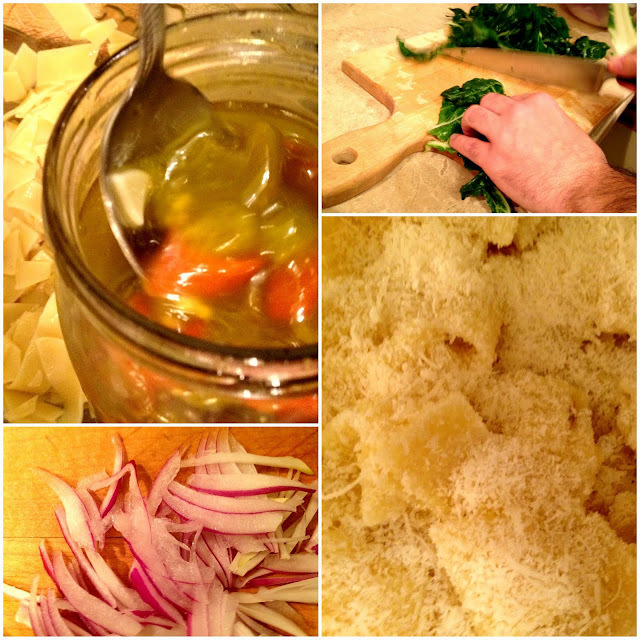 Pour entire mixture into soup bowl over noodles and grated cheese. Stir and enjoy beautiful contrasting colours of red beans and dark vibrant greens against noodles; as wonderfully earthy aroma wafts up to greet you. This looks like a delicious soup! Thanks for sharing. I LOVE this soup so much, that I make it every week! Thank you both!